DOVER AIR FORCE BASE, Del. (June 25, 1999) -- The U.S. Ambassador at Large for War Crimes, and an FBI investigative response team left Dover Air Force Base Monday headed for Kosovo to investigate possible war crimes committed by Serbian Forces during the recent conflict in the area. The FBI agents, along with more than 100,000 pounds of equipment were transported on a Dover C-5 Galaxy in support of a request by the Department of State to assist the International Criminal Tribunal for Yugoslavia in the investigation of war crimes in the Kosovo region. 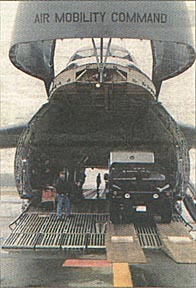 A C-5 Galaxy aircraft is loaded with FBI Humvees for transport to Kosovo. "Dover is helping us now with an airlift of about 50 FBI agents," said Paul Malett, deputy commander of the mission to Kosovo. "We are accompanied by several representatives from the Armed Forces Institute of Pathology two representatives from the Physicians for Humanity, a military doctor, two emergency medical technicians, and two investigative evidence response teams." The team was also accompanied by a small security contingent. "Our Dover Team air crews and support personnel played a major role in helping secure the peace in Kosovo," said Col. Erwin Lessel, 436th Operations Group commander. "Now that the bombing campaign is over, we are actively supporting the airlift needs of our peacekeeping forces." As part of the NATO brokered peace agreement, several countries currently share the responsibility of maintaining the peace in Kosovo, each protecting a particular sector of the region. According to Malett, each sector has sites where potential atrocities have occurred. The United States, along with Italy, Switzerland, Germany, and the United Kingdom, in close cooperation with the International Criminal Tribunal for Yugoslavia, headquarters in the Hague will be examining those sites for evidence. In Kosovo, the team's job will be to survey sites of possible mass atrocities in their assigned sector, and begin the collection and preservation of evidence. Malett says the investigative agents will attempt to determine the age, gender and cause of death of the victims found at these various sites. The evidence is intended to lead toward a case building against those that have committed war crimes in the region. According to Malett, while international investigations are not new to the FBI, this case is unique because it is the first time the FBI has investigated war crimes. This is an atypical mission," said Malett. "While we have been involved with the East Africa investigations, the Khobar investigations, and a number of other investigations, this is unique. It's unique because we are investigating crimes against citizens other than those of the United States. This is a crime against humanity. I think that is a source of responsibility and pride for the FBI, because we are part of that. This is an unprecedented move for us. "I think this is important, not just what the FBI is doing, but what all of the cooperating countries are doing," said Malett. This is people demonstrating a cooperative effort for a moral right. There is not much of a cloudy issue there. We all know what's right, and we all know with the extinction of the ethnic cleansing, or however you want to euphemize mass killings, is morally outrageous. The FBI has a part of the greater good, has a part of democracy, and has a part of the responsibility to bring those responsible before a tribunal."